January 29, 2013–The Department of State warns U.S. citizens against travel to Afghanistan. 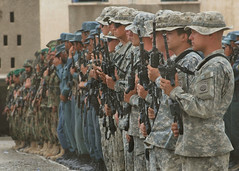 The security threat to all U.S. citizens in Afghanistan remains critical. This Travel Warning supersedes the Travel Warning for Afghanistan issued on June 27, 2012, and reminds U.S. citizens of ongoing security risks, including kidnapping and insurgent attacks. No region in Afghanistan should be considered immune from violence, and the potential exists throughout the country for hostile acts, either targeted or random, against U.S. and other Western nationals at any time. Remnants of the former Taliban regime and the al-Qaida terrorist network, as well as other groups hostile to International Security Assistance Force (ISAF) military operations, remain active. Afghan authorities have a limited ability to maintain order and ensure the security of Afghan citizens and foreign visitors. Travel in all areas of Afghanistan is unsafe due to military combat operations, landmines, banditry, armed rivalry between political and tribal groups, and the possibility of insurgent attacks, including attacks using vehicle-borne or other improvised explosive devices (IEDs). The security situation remains volatile and unpredictable throughout the country. This article continues at http://tinyurl.com/b37jxel.